I was up at 6am this morning, keeping caught up on client correspondence. I am watching Arrested Development season one. I have four painters working at the studio, cross-pollinating techniques. 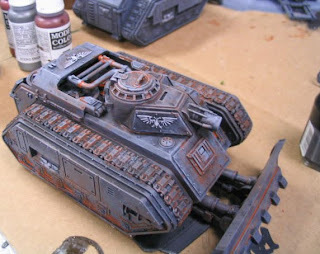 We’re doing Space Hulk and a TON of imperial guard tanks. It’s a load of fun. Renn and Dane brought a zombie video game down, but I made them take it into the break room. I snapped some various pics of the Fateweavers, too. I still need to make and paint the Heralds, two on foot and two on disc. The Forge World order came in today. Notably, this included three rhinoxen which we plan on converting into a type of Thunderwolf cavalry. So far, so good. The studio is a place of peace, light and happiness. It’s a good healthy place to be. 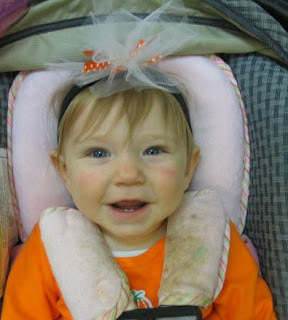 Nope, not sick of the baby pics. I just love my little snuggler! This is old, not everything is in there. But it gives the feel for it. This bad girl is clearing 4000 pts now. Oh, man. 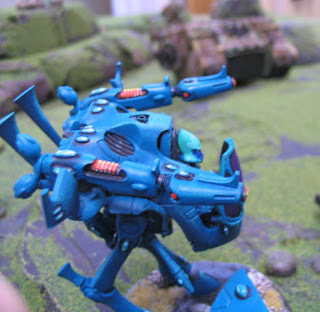 And I’ve got two Forge World super-heavy Eldar grav tanks: one Scorpion and one Cobra. But I don’t think they’re going in this army. If you want to buy them as part of an Eldar commission they are $160 each (while supplies last!). The church halloween party was tonight. 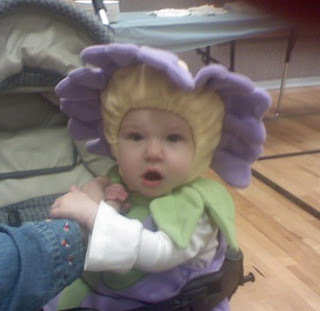 Willow was dressed up as this cute flower. 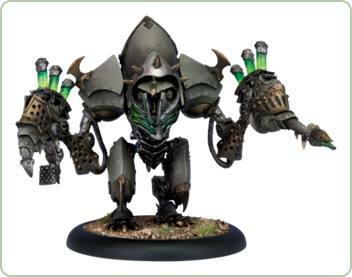 Hmmm… this on the heels of Deathguard stuff. Anyway, I also got up some Ork Barricades for sale tonight. Last Saturday I played a game of 40K with Renn. I have about an hour of footage that I need to edit. As for my list, I would have liked to take some different units but I didn’t have them. I would have dropped the Vypers and taken Fire Dragons. 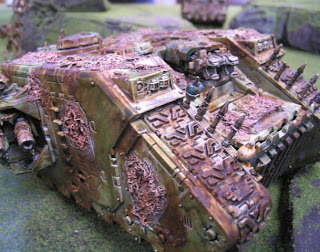 Reason being that Deathguard don’t die well to anything that does not cause instant death. 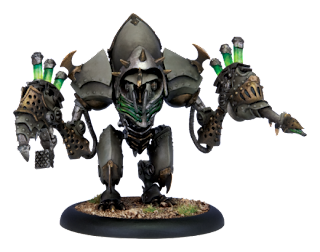 Fire Dragons are the bactine for the pustulent cyst that is Deathguard. I will be painting up twenty Fire Dragons in the near future. They’re already on order. Although Renn was afraid of them, the Fire Prisms were not as effective as I hoped. I would also drop Mind War. Getting into that 18″ range was just always a little too dangerous. I would have taken Fortune instead. A Farseer with Spirit Stones can use two powers a turn, so having a third just in case the base two (Doom and Guide). And three more War Walkers are coming. 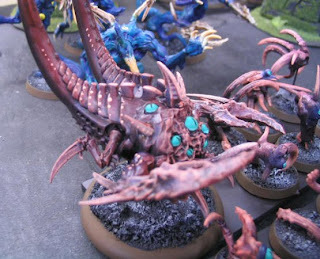 I plan, in the future, to run the Dire Avengers on foot, and two units of Fire Dragons in the Wave Serpents. No Vypers. 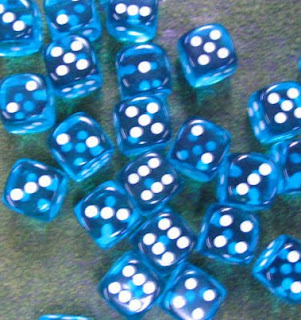 They look great, but they just do not have the punch they need. Thanks again to Advance Scout Paul who keeps it coming from the front. I got up bright and early Monday morning: 12:09am to be precise. I immediately got cracking on the email Inbox, and that is now all caught up. I’ll be ready for a bright and shiny Monday workday. It’s back to bed for me, of course. So, I say, bring on the new projects. We’re ready. UPDATE: It’s Monday morning, been pounding away for about a half-hour. Still caught up. Boooyah. Here’s a little smidgin of sunshine. Willow has two little teeth coming through on the bottom. She can now demolish bread or banana slices. She loves to wave hello or goodbye. She’s ever so good natured. She kicks her legs with excitement whenever a human she loves comes near. And that’s mostly everyone. 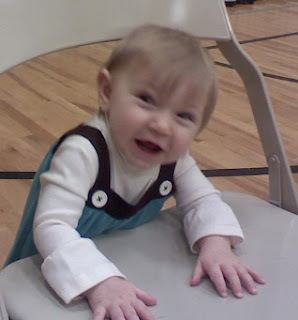 When we sing hymns in church, she tries to sing along. As usual, I am overwhelmed with excitement to read a new book by Ron Paul. Weighing in at 210 pages, and only of modest page area, it is good for multiple reads. A dedicated reader can finish it in an afternoon, or a week in the lavatory. The hardback edition is under $13 on www.amazon.com I ordered three copies. This book is more easily digestible, and more approachable that his previous works. A Foreign Policy of Freedom for example consists of mainly transcripts of his speeches on the House floor, without annotation or explanation. This is to my mind why Ron Paul was not overly successful two years ago. He doesn’t really fill in the back story, to understand him you have to be at least roughly familiar with certain documents (like the Constitution). Things that are obvious to him (like states’ rights) are not obvious to the average American. End the Fed is really a misnomer. While that is certainly one of the main thrusts, the book deals with the basics of the banking system overall. The book could have well been called Sound Money. 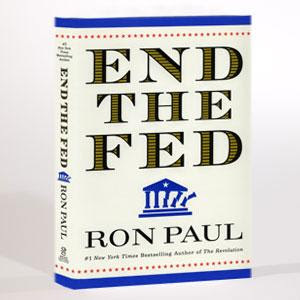 Chapter 1 is entitled “Why you should care” and in plain language explains the connection between the life of the average Joe and the role of the Fed in manipulating money. This is not conspiracy theory. It’s not a bombastic tirade. It’s done in the tone of a detective presenting the facts to the victim of a burglary. There is a healthy dose of folksiness in there. Ron Paul talks about his old coin collection, his grandmother’s land, his breakfast with the Fed Chairman. This is not contrived, it rather connects the dots in a memorable and human fashion. Sort of like chocolate chips in a cookie. There is also a golden nugget in there that mimics a thought I’ve been having: the real problem is the very concept of Fractional Reserve Banking. The concept of banking (other than its role to warehouse commodities/money and facilitate transfers) is rotten to the core. If the common man understood it he would not take part in it. But that’s another topic. Anyone who follows this blog knows that I am not overly fond of banks. This is a reasonable position. I am still working on figuring out a system by which the common man can free himself in a practical and peaceable and legal manner. Every book I read gets me a step closer.